The subject of the research in this paper is the development of entrepreneurship based on Pro-poor tourism principles in rural destinations. The aim of the research is to project development models of entrepreneurship based on Pro-poor tourism in the rural environments in Serbia. General analytical-synthetic research method has been applied, in the span of bibliographic-speculative, to empirical approach. The poverty of rural population is a heated problem in many countries, Serbia included. Developing entrepreneurship in the feld of tourism stands out as one of the most effcient ways to solve this problem. Focusing on the just allocation of material and immaterial goods in a local community area includes adopting the concept of tourism and entrepreneurship development based on Pro-poor tourism. This includes the development of micro type businesses, small and family companies, the development of tourism business through diversifcation of products and activities traditional for the households in rural areas, and including the development principle that focuses on the interests of the poorest members of the local community. For this reason, reliance of local resources with promoting local capacities and increasing the participation level of the local community in developmental activities is the key of success of Pro-poor strategies. 1. Amorós, J.E., Bosma, N. (2013). Global Entrepreneurship Monitor 2013 Global Report Fifteen Years of Assessing Entrepreneurship Across the Globe. Global Entrepreneurship Research Association, Desarrollo. 2. Andrić, N., Tomić, D., Tomić, G. (2010). Status and Perspectives of Development of Rural Tourism in the Autonomous Province of Vojvodina. 118th EAAE SeminarRural development: governance, policy design and delivery, Ljubljana, Slovenija, pp. 611-621. 3. Ashley, C. (2006). How Can Governments Boost the Local Economic Impacts of Tourism? SNV East & Southern Africa, Nairobi, Kenya. 4. Ashley, C., Roe, D., Goodwin, H. (2001). Pro-Poor Tourism Strategies: Making Tourism Work For The Poor, A review of experience, Pro-Poor Tourism Report No. 1. Overseas Development Institute, London. 5. Bennett, O., Roe, D., Ashley, C. (1999). Sustainable tourism and poverty elimination study: a report to the department for international development. Podgorica: United Nations Development programme, offce in Podgorica. 6. Čikić, J., Petrović, M., Đurđev, B. (2015). Diffusion of knowledge and rural tourism development – Example of Vojvodina. Economics of Agriculture, 62(1), pg. 123-136, Institute of Agricultural economics, Belgrade, Serbia. 7. De Beer, A., De Beer, F. (2011). Reﬂections on pro-poor tourism in South Africa: challenges of poverty and policy in the search for a way forward. Journal of Contemporary Management, 8, pp.591-606, University of Pretoria, South Africa. 8. Delić, S. (2012). Sustainable development factors of agriculture in AP of Vojvodina. Novi Sad: The Faculty of Agriculture, University in Novi Sad. 9. Deloitte & Touche, IIED, ODI, (1999). Sustainable tourism and poverty elimination study, Report to the sector for international development, United Nations Development Programme, offce in Podgorica, Podgorica. 10. Demonja, D., Baćac, R. (2012). Contribution to the Development of Rural Tourism in Croatia: Proposed Steps for Successful Business. Tourism, 16(4), pg. 134-151, The institute for tourism, Zagreb, Croatia. 12. Đuričić, B. Đ. (2011). The imact of tourism on the development of agrarian production in Zlatibor municipality. Science conference with international participation - Agrobiz 2011, Novi Pazar, Serbia, pg. 115-122. 13. Epler-Wood, M. (2002): Ecotourism: Principles, Practices & Policies for Sustainability. UNEP, TIES. 15. European economic and social committee (2011). Opinion of the European Economic and Social Committee on Rural Development and Employment in the Western Balkans. European economic and social committee, Brussels. 16. Fotiadis, A. (2011). The role of tourism in rural development: the role of tourism in rural development through a comparative analysis of a Greek and a Hungarian rural tourism area. Lambert Academic Publishing, Saarbrücken. 17. Garrod, B., Wornell, R.,Youell, R. (2006). Re-conceptualizing rural resources as countryside capital: The case of rural tourism. Journal of Rural Studies, 22(1), pp. 117-28. Institute of Rural Sciences, University of Wales Aberystwyth, Aberystwyth, UK. 18. Goodwin, H. (2009). Reﬂections on 10 Years of Pro-Poor Tourism. Journal of Policy Research in Tourism, Leisure and Events, 1(1), pp.90-94, Taylor & Francis Online. 21. Jamieson, W., Goodwin, H., Edmunds, C. (2004). Contribution of Tourism to Poverty Alleviation Pro-Poor Tourism and the Challenge of Measuring Impacts. Transport and Tourism Division, UN ESCAP, Bangkok. 23. McAreavey, R., McDonagh, J. (2010). Sustainable Rural Tourism: Lesson for Rural Development. Sociologia Ruralis, 51(2), pp. 175-94, Queens University Belfast, Belfast, UK. 24. Meyer, D. (2007). Pro-poor tourism: from leakages to linkages. A conceptual framework for creating linkages between the accommodation sector and ‘poor’ neighbouring communities. Current Issues in Tourism, 10(6), pp. 558-83, Taylor & Francis Online. 25. Milić, B. (2011). Rural development: practicum for local actors. Standing Conference of Towns and Municipalities , Belgrade. 26. Organisation for Economic Co-Operation and Development – OECD (1994). Tourism Strategies and Rural Development, OCDE/GD(94)49, Paris. 27. Petrou, A., Pantziou, E.F., Dimara, E., Skuras D. (2007). Resources and activities complementarities: the role of business networks in the provision of integrated rural tourism. Tourism Geographies, 9(4), pp. 421-40, Taylor & Francis Online. 28. Petrović, G., Maksimović, M., Karabašević, D. (2017). Strategic positioning of rural tourism on Stara planina, Economics of Agriculture, 64(2), pp. 601-616, Institute of Agricultural economics, Belgrade, Serbia. 29. Rikalović, G., Stojanović Ž., Zorka Z. (2012). New pattern of economic development and employment – model of creative rural industrialization. Proceedings of Matica Srpska for Social Sciences, no. 141, pg. 565-82, Matica srpska, Novi Sad, Serbia. 30. Sattar, S. (2014). Potential of tourism in poverty alleviation and development of Sikkim. IASSI Quarterly Bulletin, 32(3), pp.72-85, Indian Association of Social Science Institutions, New Delhi. 31. Saxena, G., Clark, G., Oliver, T., Ilbery, B. (2007). Conceptualizing integrated rural tourism. Tourism Geographies, 9(4), pp. 347-70, Taylor & Francis Online. 32. Shtaltovna, A. (2007). Role of Governance in the Diversifcation of Rural Economy, Analysis of two Ukrainian Cases, M.Sc. thesis, Ghent University of Belgium, Ghent, Belgium. 33. Silva, L., Leal, J. (2015). Rural tourism and national identity building in contemporary Europe: Evidence from Portugal. Journal of Rural Studies, 38, pp. 109-19, Elsevier. 34. Svetozarević, I. (2012). A guide to rural tourism. RARIS, Regional agency for the development of the Eastern Serbia Zaječar. 35. Ševarlić, M.M., Petrović, Z. (2011). 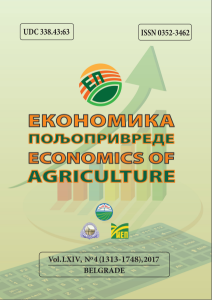 The development of countryside tourism in Gornji Milanovac municipality – a model example for the villages in Serbia, Agricultural economics, 58(3), pg. 457-473, Institute of Agricultural economics, Belgrade, Serbia. 36. Škrbić, I., Jegdić, V. Milošević, S., Tomka, D. (2015). Development of Sremski Karlovci wine tourism and integration in the regional tourism offer. Economics of agriculture, LXII(1/2015), pp. 229-244. Institute of Agricultural economics, Belgrade, Serbia. 37. Tolkach, D., Pearlman, M., King, B. (2012). Key Implementation Factors in Pro-poor Tourism. Tourism Recreation Research, 37(1), pp.3-13, Taylor & Francis Online. ŠKRBIĆ, Iva; JEGDIĆ, Vaso; MILOŠEVIĆ, Srđan. PRO-POOR TOURISM FOR THE PURPOSE OF RURAL ENVIRONMENT DEVELOPMENT. Economics of Agriculture, [S.l. ], v. 65, n. 1, p. 373-389, jan. 2018. ISSN 2334-8453. Available at: <http://ea.bg.ac.rs/index.php/EA/article/view/29>. Date accessed: 19 apr. 2019. doi: https://doi.org/10.5937/ekoPolj1801373S.